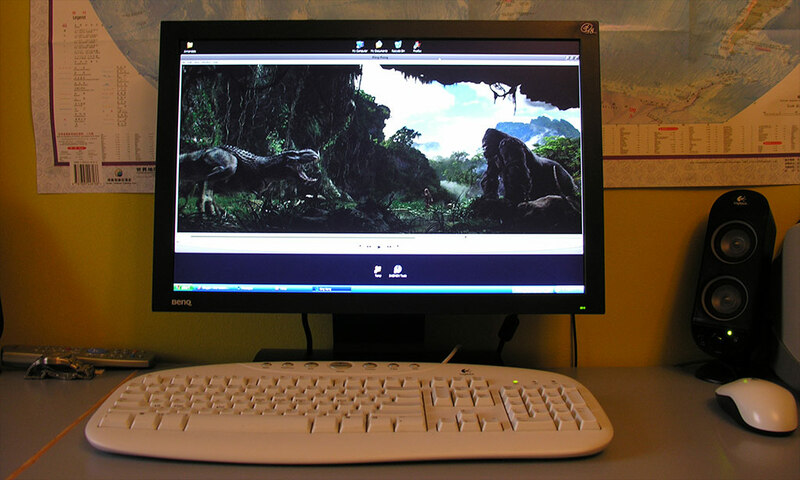 Well, today I got my BenQ FP202W LCD monitor from MSY for a bargain $AU615. I’ve only played around with it for a few hours, but I’ll try to give a review of it without repeating a lot of the boring specifications the other sites might write about. This 20 inch widescreen monitor comes in a packaging box that might make you feel extremely happy for what you’ve just paid for. However, after you’ve opened it, you come to accept the fact that a 20″ isn’t that big. When I put my 17″ infront of this 20″, I was a little disappointed by the little difference I saw between them, however after I’ve turned it on, I was shocked by the quite considerable difference between them. Setting up was quite a breeze. The first time I resumed my computer from standby after plugging in the new monitor, the resolution and aspect was incorrect. However it was simply fixed by just a quick restart. In the first few minutes, I noticed the colours were a lot more vibrant and darker than my old monitor. Although calibration is unrequired, after I tweaked around with the colour profile, brightness and contrast the colour were a lot more ‘normal’. In addition to the colour problem, text also seemed blurry and less readable. I fixed this by tweaking ClearType using the ClearType PowerToy. After all the troubles, I finally found time to actually enjoy the display. And I’m amazed by how immersive a widescreen display can be. 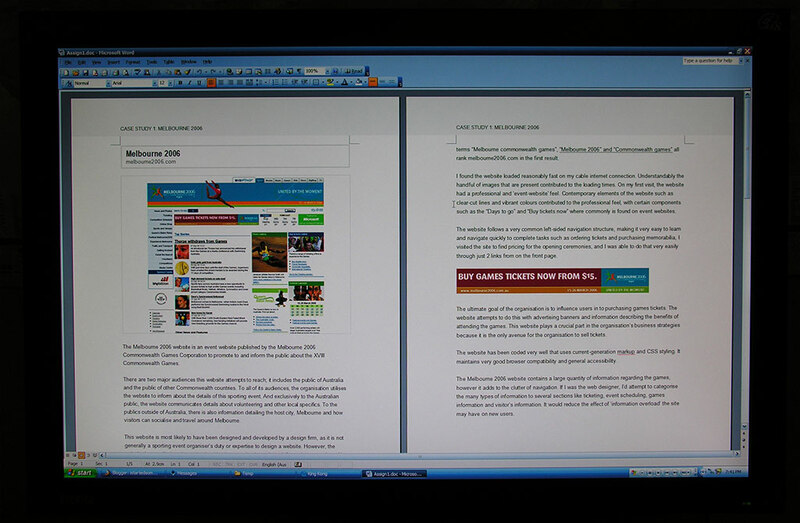 Whilst 1680×1050 may not add a lot more pixels than 1280×1024, the larger size of the display really make the display seem enormous. The only negative aspect of the display that is really important is the response time. Even though BenQ officially specifies that the response time is 8ms, I have found that it wasn’t the 8ms I was expecting. Compared to my old 16ms panel, I personally don’t feel 8ms is an accurate representation. If I was to judge purely by looking at it, I would say it is similar to a 16ms panel, so don’t expect absolutely minimal ghosting. Having said that, I have found gaming quite enjoyable on a 16ms panel, and the only media that really sacrifices detail due to ghosting is watching fast-motion videos sometimes on TV. Other aspects of the panel include the button-less bezel. I think BenQ really improved the aesthetics of the panel by moving the buttons to the side of the panel, but it makes changing settings quite awkward. But I don’t find it a big issue because it’s not going to be used often. 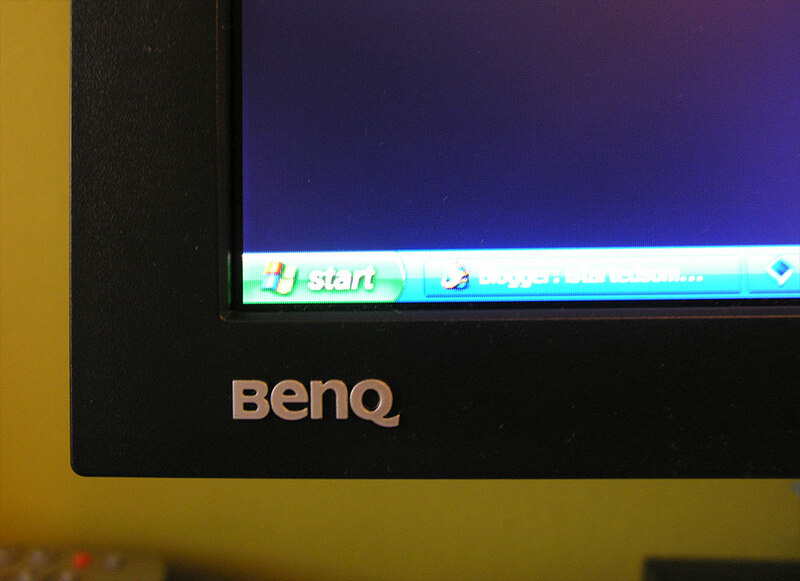 The BenQ logo sits on the bottom left corner of the bezel and adds a bit of class to the panel by having a bevel. The indicator light on the right avoids taking too much attention by having a rather dim glow, which is a good thing. However, the bezel isn’t exactly thin. It is about always 4cm or 1.5″ wide across all four sides. 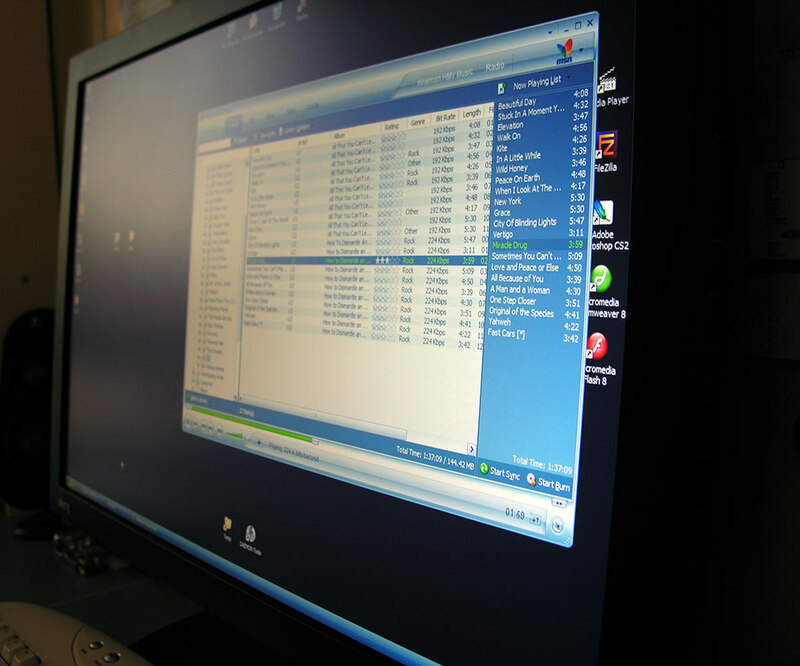 Although I don’t find it a problem, if you’re planning to have a dual screen set-up, then it will be quite obtrusive. Having said everything, I don’t regret my purchase. The size of the monitor is really fantastic value for its low price. The next best thing is probably the Dell 24″, but it is nearly double the price. For which, I would rather 2 of this, and do a dual 20″ widescreen set-up. 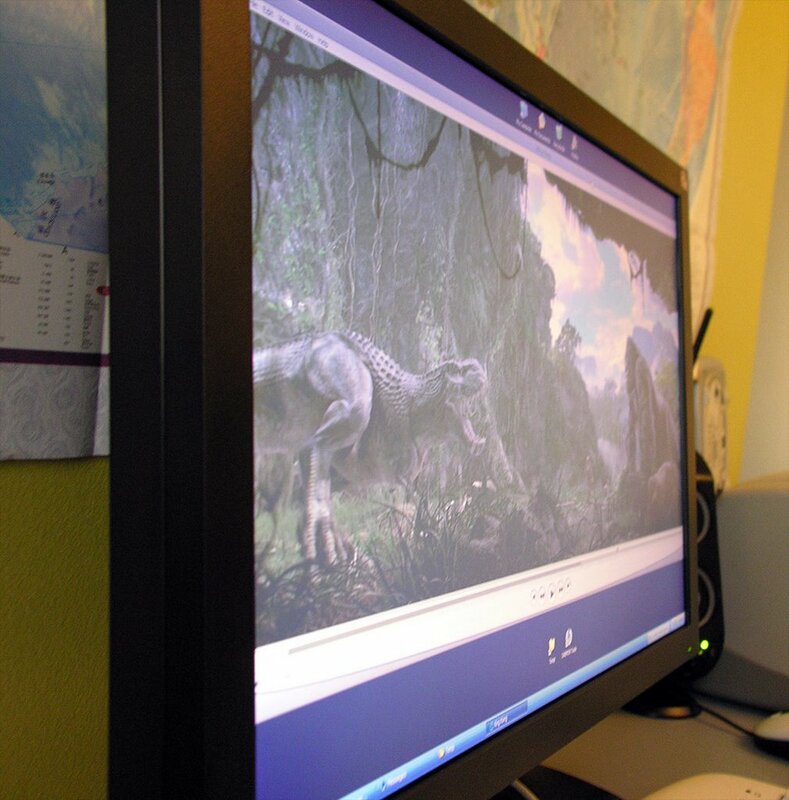 I recommend this monitor for anyone that may be looking for a value-based widescreen display. I want to clarify. When I was referring to the 20″ size, I was talking about the 20″ widescreen size. Obviously being a diagonal measurement, a normal 20″ will be a lot ‘bigger’ than the 20″ widescreen. i was buying this screen just now… and i´ve found your article. Thanks a lot!